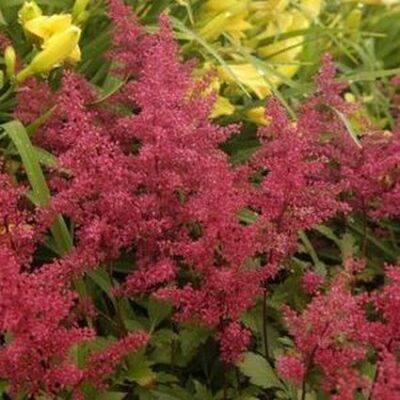 Astilbe Red Sentinel, Astilbe japonica ‘ Red Sentinel’, is one of the most outstanding red Astilbes! Deep forest-green leaves have mahogany-red stems which nicely compliment the scarlet-red flowers. 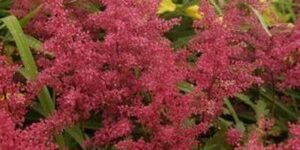 ‘ Red Sentinel’ is a real eye catcher! 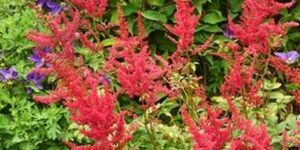 Plant Red Sentinel in mass or groups in shade gardens, woodland gardens and shaded areas of border fronts or cottage gardens. 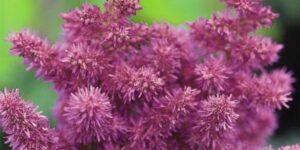 It is excellent large ground cover or edging plant for shady areas. 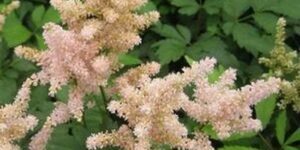 Astilbes are long-lived perennials that are most comfortable when grown in rich soil and light shade to filtered sun. 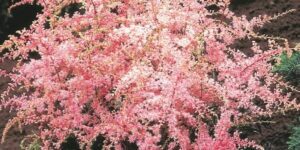 They will grow in full shade, but will not bloom as prolifically there. 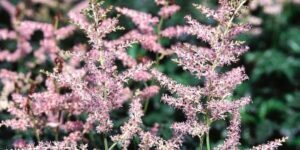 Though they are easy to grow, Astilbes have one critical requirement–lots of water. Plants must have consistently moist soil; dryness leads to a quick demise, especially in the sun. 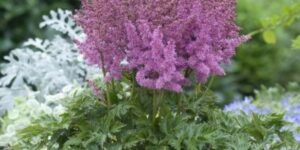 Fertilize Astilbes in late spring before flowering starts. Wait to cut back the old foliage until spring; it will help protect the plant from winter damage.